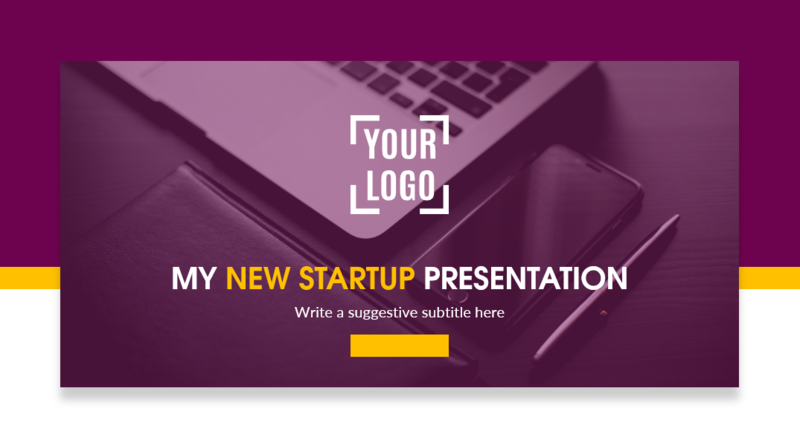 Looking for a way to present and promote your startup? You can have the best idea ever, but supporting your words with a professionally-looking presentation is must-do to impress investors. Tell why you do it all. Introduce the company vision, mission and targets. 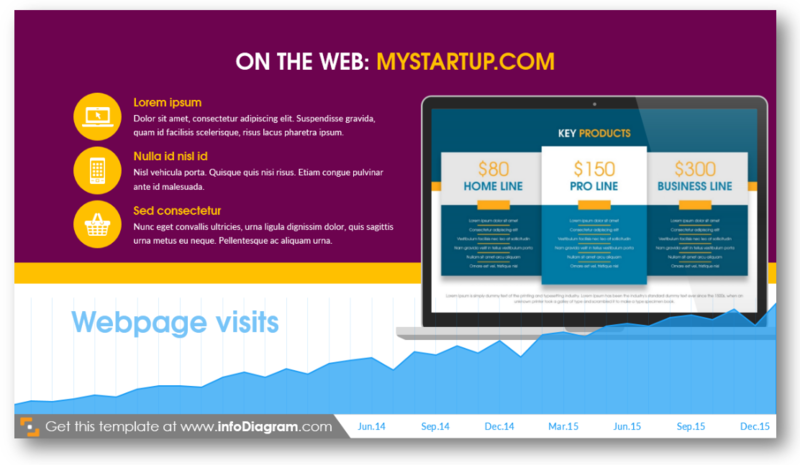 Tell your start-up story and history timeline. 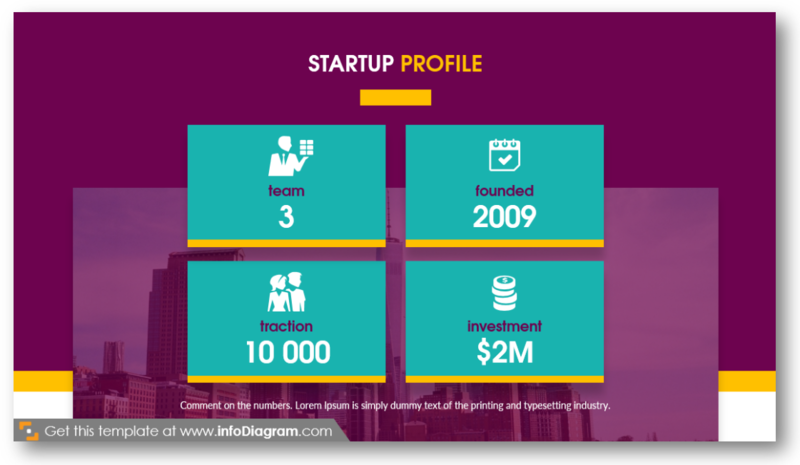 You can add the founders’ profile or project team overview. Explain what you do – What are your main products and services. Present your website or its mock-up. Describe the market potential by defining the target customer group, explain the profile of your sales persona and present the competitors’ analysis. Show what’s your Unique Selling Proposition comparing your start-up idea with others. 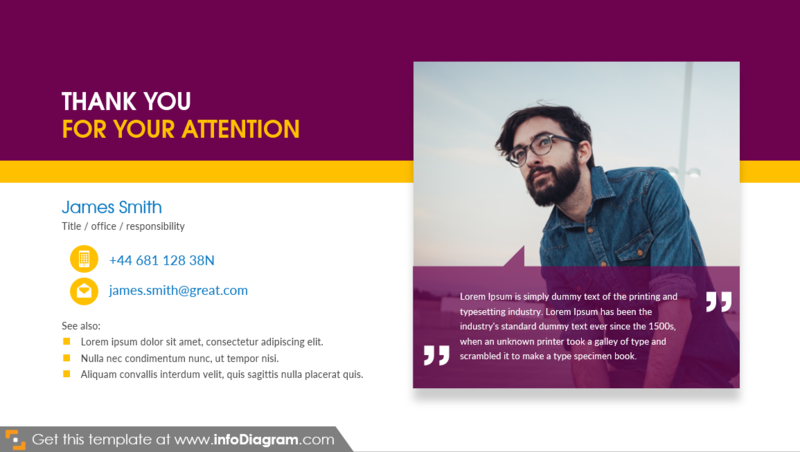 Note: All slide examples are from Startup Presentation Template slide deck. Click the pictures to see details. Begin as describing life the audience knows it. Then establish a conflict between “what is” and “what it could be”. The gap between the two will throw a bit off balance, and that’s a good place to push your ideas. Continue with the reason why you are there and how you want to change the world. Don’t overload this slide with illustrations and pictures – it will distract listeners. Talk numbers. Notice you can see only key figures in the example, not any long text descriptions there: number of people in a team, year of foundation, traction and investment. Show only a few key numbers: use big font and show only those numbers on a clear slide. The same rule applies to the historical timeline: show major events (when you think everything is important, nothing truly is). Think of what may be interesting for your potential audience, what can impress them. 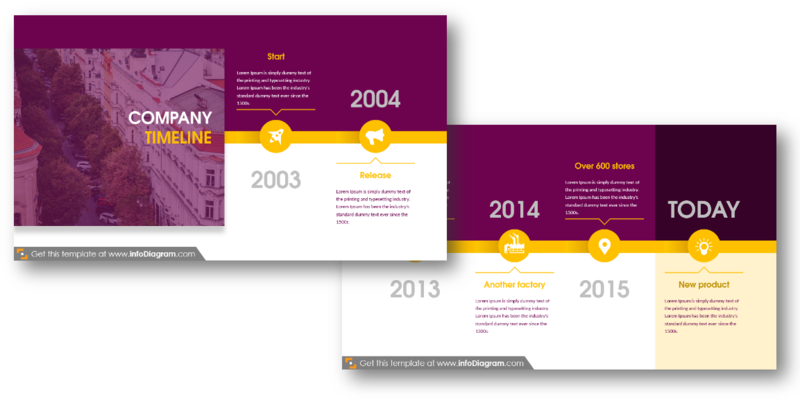 For more timeline design illustrations see this article: 7 Types of Creative Timeline Design. A place for a moment of fame (if you’re the founder 🙂 ). Put a nice picture, maybe short description and that’s it. Your success will speak for you. Show briefly products and services you offer. Better to show highlights and bestsellers, than make a bullet-point list. Design advice: Limit the number of products to 3 to 5 items. Average listener has problems remembering more points. Then present your website and aside you can list best features. It would be great if you put some statistics near like we did on the example slide. If you want to use more data charts, check those 6 Examples of Redesigning Boring Excel Charts in a PowerPoint. Audience like seeing people more than products. So tell a short story about team members, you can even include fun fact. State features or usage examples on this slide. You can also illustrate them with icons, or use the minimalistic slide as on the picture. Customer’s needs above all. 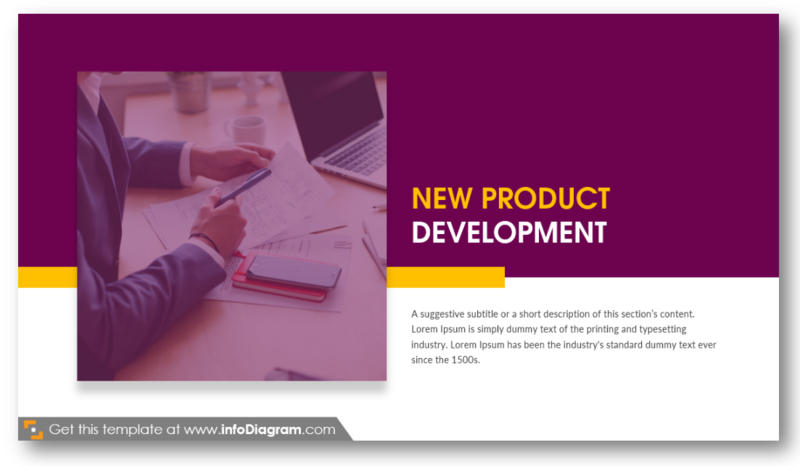 A customer is the first point you have to think about before release of the new product. Who are my customers? How old are they? Where do they live and work? Create infographics or reuse this particular slide. For competitors’ comparison apply simple table: it is easy to read and to notice differences. Don’t forget to thank your audience for listening. The ending is as important as the beginning. So use it properly. You can add a specific call to action (“try our new app”, “subscribe”) or provoke discussion by asking an open question to the audience. The most important in a pitching your idea is the speech. You may do it also without any slides if your message is simple and you feel your speaking skills can cover it well enough. However, having a set of vivid slides behind you help to support your message. Presentation tip: Don’t let your slides be more important than your speech. They should support you. Hence use only key words and key numbers, not full sentences in your visuals. Reserve enough time for rehearsals. Do it at least three times, alone in front of the mirror, in front of your peers or family. And if you want to work on your public speaking skills long-term, check for Toastmasters.org club. 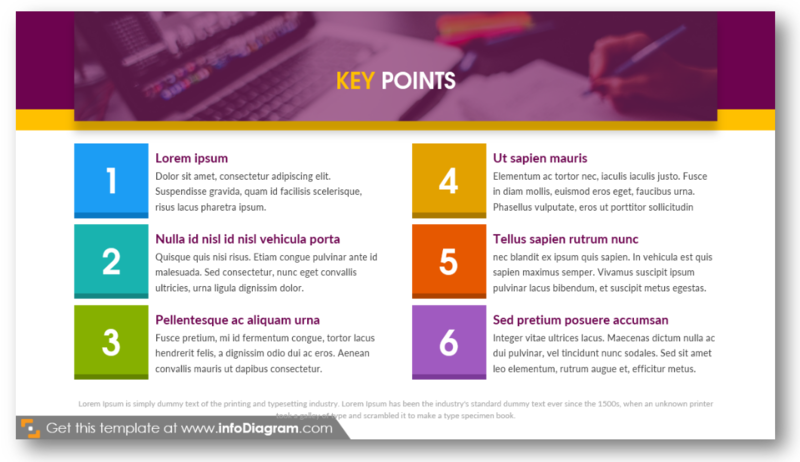 To help with preparing outstanding pitch deck slides, we designed this editable template of PowerPoint slides for start-ups. 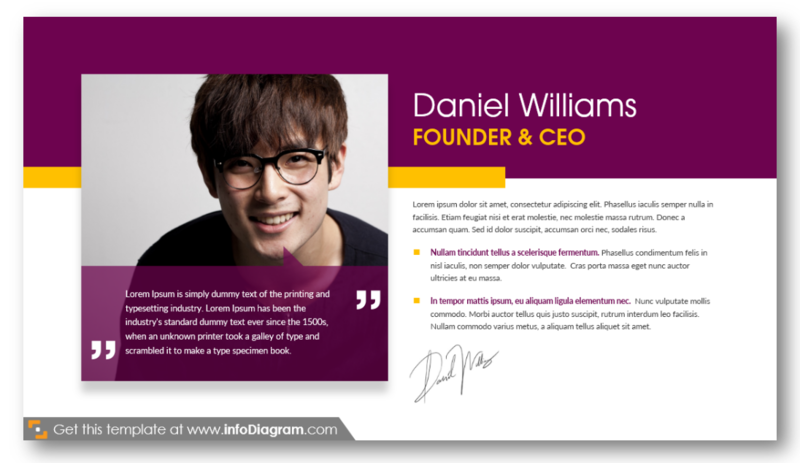 The template contains a slide for each presentation section: title and logo, start-up statements, profile and history, founder and CEO biography, key products and services, website, information about new product development, project team, target audience, competitors analysis, final slide. 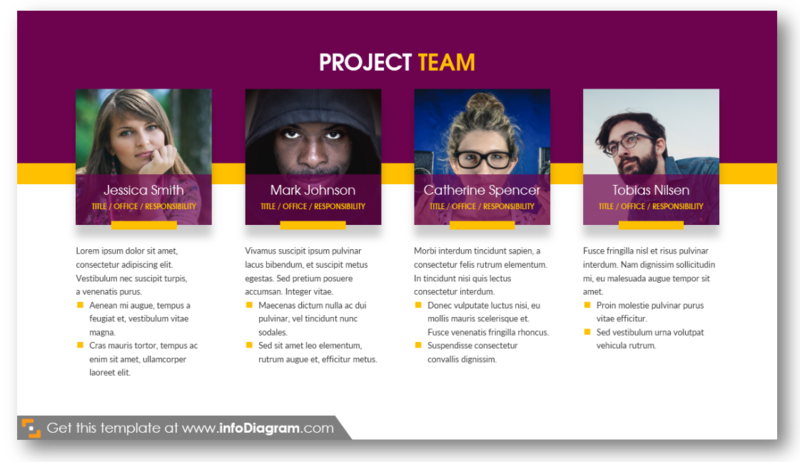 If you decide to apply such layouts to create your slides, all these graphics are available as PowerPoint slides. They can be imported also to other presentation software such as Google Slides or Keynote. 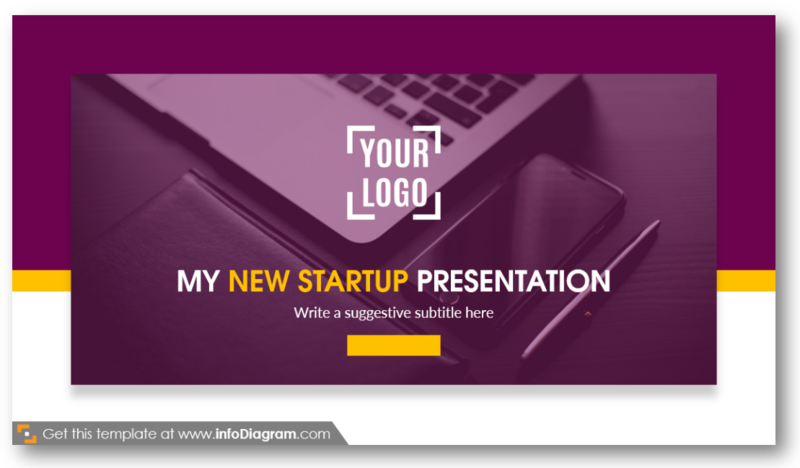 The template contains strong slide visuals for each presentation part and you can easily replace images and adapt content to describe your business idea. 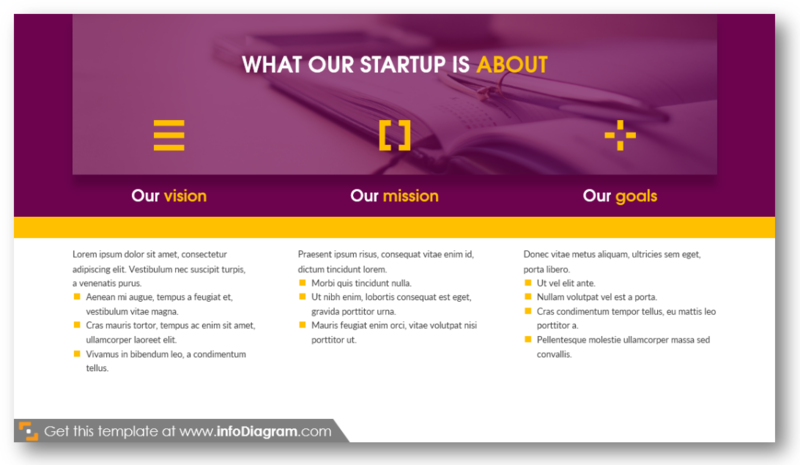 What’s inside Startup Presentation Template? If besides pitching your start-up to investors, you also have to create a market strategy, then visit our Business & Marketing diagrams page – Strategy Planning section.